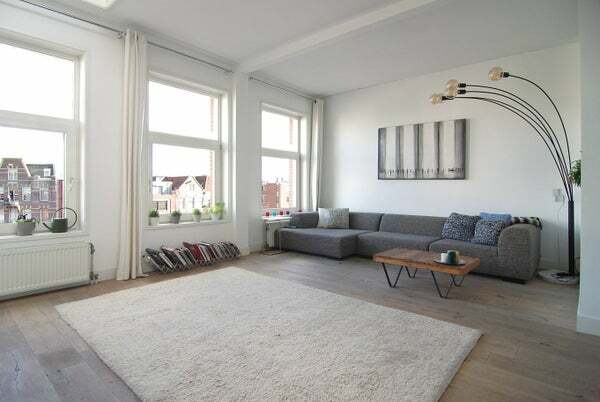 Amazing and bright 2 bedroom apartment, fully furnished, covering the top three floors of this townhouse in the Jordaan overlooking a canal. The property boasts 3 balconies and a 35 m2 roof deck terrace. Private street entrance and two flights takes you to the second floor of the town house and first floor of the apartment. This floor has two large bedrooms, walk in closet, separate washroom and full bathroom. Both bedrooms have a balcony, one facing the street, the other the southwest and interior gardens. The bathroom has a large sink, shower, toilet and bath tub. One floor up is the living with semi open kitchen, guest toilet and dining area. Another balcony facing the interior gardens as well as an open view to top floor of the apartment, which can be reached via an open staircase. The top floor can be used for working out, or making a home office. It has a kitchenette and is adjacent the large roof deck terrace facing southwest.